Consulting psychologist Alex Delaware has a novel approach to crime-solving: he uses his training to unlock the secrets in the minds of the victims and jiggles the clues he finds there until the right scenario emerges. So when Alex's LAPD buddy Milo finds the hacked-up body of a woman psychologist named Claire Argent in an abandoned car trunk--the second such murder in eig...moreConsulting psychologist Alex Delaware has a novel approach to crime-solving: he uses his training to unlock the secrets in the minds of the victims and jiggles the clues he finds there until the right scenario emerges. So when Alex's LAPD buddy Milo finds the hacked-up body of a woman psychologist named Claire Argent in an abandoned car trunk--the second such murder in eight months--Alex heads for her place of employment: the Starkweather State Hospital for the Criminally Insane. One of Argent's patients at Starkweather is Ardis "Monster" Peake, imprisoned for the unbelievably brutal murders of his mother and the family she worked for, including a small child and a baby. There's at least one eerie similarity between the mutilation of their bodies and Argent's: in all the bodies, the eyes were taken or destroyed. But Peake, diagnosed as schizophrenic and psychotic, is a well-behaved vegetable due to a steady diet of Thorazine, and he hasn't left the hospital since his incarceration 15 years before. How is it, then, that Claire Argent's assistant, Heidi Ott, swears she heard Peake say, "Dr. A. Bad eyes in a box" soon after he hears only the bare fact of her death? And why does Alex find Peake so empathetic, in spite of his violent past and chillingly vacant mind? When other mutilated bodies turn up, Alex and Milo begin to suspect that the real monster is very much at large. 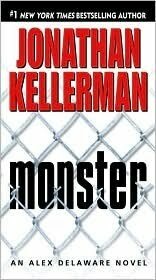 Monster is the third Kellerman novel I've read and with every book read,I like his writing even more. I picked up this book at a bargain at a second hand store as i don't normally buy my copies of thrillers and borrow them from libraries.Faintly reminiscent of The silence of the lambs and more of ,Hannibal Lecter, I found the book spine chilling and gripping.The pace is not really high-adrenaline inducing,but Alex Delaware and his LAPD buddy Milo chip away industriously at uncertainty to make sense of madness behind Monster's random babble. Narrated from Alex's point of view,Monster is 13th in the row of Alex Delaware books.I was surprised at Jonathan's style of writing -vivid descriptions and flowery words somehow don't normally get associated with crime writing,more so with a psychological thriller,but you'll find that in this book.What I find fascinating about books like these is the psychological profiling that unravels during the course of the investigations.The book gives you a sneak peak into the workings of an institution for mentally unstable criminal-Starkweather hospital in this case.It also made me wonder about the safety of the carers and the techs that man these facilities.Either they must be highly motivated or paid very well to take up a job that is fraught with so much risk. Character-wise I can't choose between Milo or Alex and say who I liked better.I also liked the way how Kellerman lets us see a bit of Alex's personal life in between the investigations.The murders that take place are slightly disturbing and not for the faint-hearted and in most cases Kellerman describes the crime scene almost clinically,going over details of the onslaught on the victim.Almost 200 pages into the book,we get to know who the possible murderer might be and its more a question of the duo locating him. Overall ,this might not be the best psychological thriller I've read till date, but it was good nevertheless.4/5 for this book. I recommend it to people who like reading psychological thrillers.